One of Australia’s most exciting gallopers will strut his stuff on Saturday — not in a $1 million Group 1 race in Sydney, but an $80,000 handicap at Caulfield. But trainer Danny O’Brien couldn’t be happier. 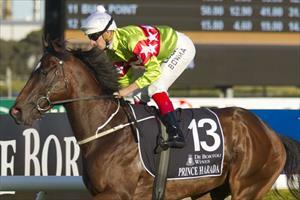 He has waited more than a year to saddle Prince Harada, a son of Haradasun formerly trained by Tony Vasil. “He is an absolutely quality horse,” O’Brien said. “Tony always had a high opinion of him — running him in Group races after his first two wins — and he is an outstanding judge. “When he took time off I was delighted to get him. We had him gelded almost immediately. It had been hard for the owners to do that before because they had a top colt who was aiming at Group 1 races such as the Caulfield and Australian Guineas. “But now he is gelded, he has a racing weight of 545kg, he is sound, strong, happy and healthy. I can’t wait to see him in action on Saturday and if he wins we can start planning a big future for him. O’Brien said Prince Harada had blossomed in the year since he last raced, when he was seventh in the Australian Guineas at Flemington. “He trialled well last September preparing for a crack at the spring carnival, but he had a few niggles so we sent him to the paddock during September, October and November. Prince Harada won an 800m jump-out at Werribee on March 20 with race jockey James Winks in the saddle. “He’s always had the ability,” O’Brien said. “He could well have been running around in Sydney at the moment, but instead we’ll kick off with this Benchmark 90 over 1100m.